Longo Brothers Fruit Markets Inc. Web site notes that “attention to quality, freshness and goodness” is very much a Longo’s family tradition. Executives at the Mississauga, Ont.-based grocery retail chain say to live up to this goal, all its stores need to be stocked with fresh produce, in the right quantities, in response to constantly changing customer demands. But the scope of that mandate, they say, goes much further. It also means ensuring items in each of their stores meet Canadian safety standards, and that recalled products are removed from store shelves with speed and precision. To accomplish this, the Ontario grocer has rolled out an enhanced product recall system from GS1 Canada. (GS1 Canada is a member of GS1, a global, non-profit supply chain standards organization). Longo’s has 18 store locations in Ontario, as well Grocery Gateway, its online grocery business, which it acquired in August 2004. The new GS1 Canada product recall program was officially launched Tuesday at a function in Toronto. Initially, the program is being implemented in the grocery sector, and a subsequent rollout to the general merchandise and pharmacy sectors is being planned for 2010. Longo’s is one of the first major grocery chains to implement the enhanced system across all its 18 stories. Key expected benefits include streamlining and standardizing the process, especially communication between vendors and Longo’s recall coordinator. And this, it turn, is expected to significantly improve the speed and safety of the recall process. Maile’s role at Longo’s encompasses all aspects of food safety — from regulations and compliance in stores to recall executions, from nutritional data and compilations, to dealing with customer food complaints. When handling recalls, she said, standardization of communication between manufacturers/vendors and retailers is crucial. As a grocery store that interacts with hundreds of vendors, she said Longo’s used to receive recall information in many disparate formats, such as e-mail, or through its category managers and so on. Maile said the enhanced GS1 Canada Product Recall System doesn’t change the way Longo’s handles recalls at the store level. Canadian retail organizations say standardization of recall information is one of the most useful features of the new system. “Our members know that reputation and brand are linked to consumer confidence and protection, so they understand the importance of a strong product recall system, said Diane Briseboise, president and CEO, Retail Council of Canada. The Retail Council is a non-profit outfit representing more than 30,000 retail stores coast to coast. If this doesn’t happen, or the retailer can’t provide proof that the recall has been properly executed, there could be serious legal and reputational consequences, she said. The enhanced GS1 program reflects this emphasis on information standardization, authentication and security. At the Toronto launch event, Tim White, director of product development at GS1 demoed key aspects of the system, which he played a key role in developing. The program uses a series of questionnaire type forms that were built based on the input of Canadian businesses. They ensure that all the information that businesses consider essential is included in the recalls communications process. Key pillars of the new program are: GS1 standardization, authentication and security. 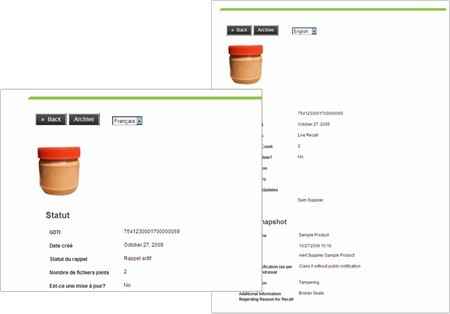 Citing a hypothetical example of the recall of peanut butter jars from a retailer, White showed how it all works in practice. The business issuing the recall has to complete a standard online questionnaire providing information such as the product name, the recall date, product images, as well as any attachment associated with the recall, said White. 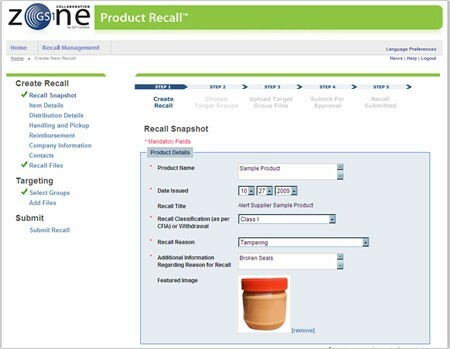 He then demoed the retailer view of the portal – the standard form accessed online by each participating retailer that’s populated with product recall information communicated directly from the manufacturer or distributor of the recalled product (in this case, the peanut butter). Having this information available at one location, in standard format, is a far cry from the process in place until now, White said. The new system, he said, eliminates ambiguity. Through the portal each participating retailer is able to access comprehensive information that clearly identifies the item being recalled. In addition, retailers can also access broader information including item details, distribution details, handling and pickup data, and much more. Retailers get to view this information in English and French. “A powerful feature of this is the ability of retailers to communicate back to manufacturers telling them exactly how much product has been taken off the shelf,” said White. Maile from Longo’s said the grocery retailer has already incorporated the new GS1 system into its recall processes. She outlined the process currently in place at Longo’s stores. She said on receiving the e-mail, the store managers ask a team member within that department to pull the product off the shelves, take a count and dispose of the item in a safe manner. Once the recall is completed, she said, forms are filled out by the “collecting” team member or “disposing” team member at the stores, as well as by the store manager. These are faxed to back to the recall coordinator on a designated recall fax machine line. But she said she and another person who receives recall information from suppliers were trained on the use of the new portal. And it isn’t just large or mid-sized grocery chains that can benefit the standardization offered by the GS1 product recall system. The “enhanced” tool will also enhance communication with smaller shops, noted John Scott, president and CEO, Canadian Federation of Independent Grocers (CFIG). He said CFIG, which has been around for about 50 years represents larger independent grocers, such as Longo’s and Highland farms, as well as some very small ones across Canada.